That, ladies and gentlemen, is a normal baby girl. I know this, because I signed up to do massive amounts of genetic testing on her - not just counting chromosomes which is your normal amniocentesis. Because of my "advanced maternal age" and because the twins are autistic - we qualified to do all sorts of fancy studies. 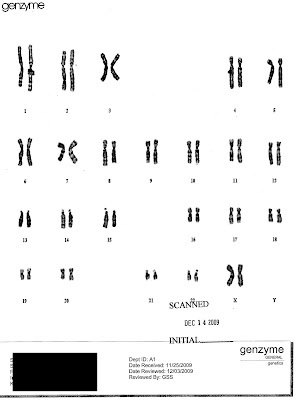 They're going to keep our chromosomes on file and study them and use them in various research studies where they are looking for patterns which detect disease. And not just eyeballing them - looking at them at incredible detail under the microscope for any sort of error.....they can see some cancers this way. If they find them on us - they'll contact us. Nutty -eh? This one is mine. Did you ever see your own chromosomes? It freaks me out a little - these are what I am made of. They're so bizarre - but I'm told that they are completely normal - I've had myriad phone calls saying that they've passed this and that and the other thing. 100% NORMAL - at least at the chromosome level. This is the husband. 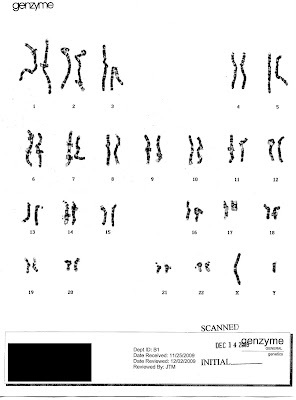 See the Y chromosome? I don't even know how they think some of these match, it's so bizarre. 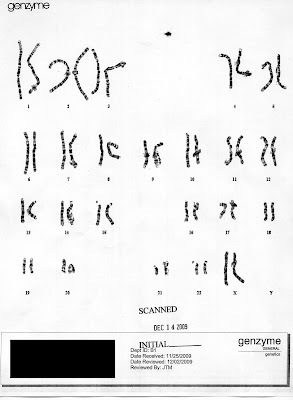 What freaks me out, based on some of the things we've learned, is that they can see autism (sometimes or all the time I'm not sure) as a microscopic chromosome error. They don't know how it's caused........but they can see it. What then gives me pause is that if they can see it - then in the future they can make decisions to eliminate it. And you know what I mean. I'm very pro choice - but based on the papers I signed which allow them to keep my chromosomes and DNA on file at Columbia......I just felt the way the wind was blowing. Genetic Selection will become a reality. I just participated in the process. I did it for selfish reasons - because I wanted to hear that my baby girl was ok. And it will be invaluable in detecting disease and other problems so you can be prepared at birth. I'm not going to worry about a future I can't change, and I'm really glad for all the good it will do. I'm just sad that someone someday might make a choice that would deny them curly headed boys who give kisses and love the Teletubbies. Because sometimes you don't know that you would want something until you are faced with it. And then you know you'd rather have that, than nothing at all.